I think it's quite spiffy, myownself. I rather like the bolder colours, to contrast with my subdued character. I'm back from Monterey and Pebble Beach, and the most spectacular bunch of cars I've ever, ever seen. I'll post pics and stuff when I know what the paper wants first, but what a spectacular show. It's called Concours d'Elegance, and I kept getting it wrong, but now I know. We also spent a day at Laguna Seca watching vintage racing. So so so much fun. Got to trundle along the coast the first day - we had a driver - so we went down to Big Sur, and through Carmel. And Carmel Valley. And Carmel By the Sea. Yes, there are that many Carmels. I looked for Clint Eastwood every single place we went. I did not see him. More likely, he saw me first. The Concours is a fancypants event, like Ascot or Wimbledon, but with cars instead of horses or tennis. The best part was watching what people wore. Tons of money there, but somehow, well, I dunno. 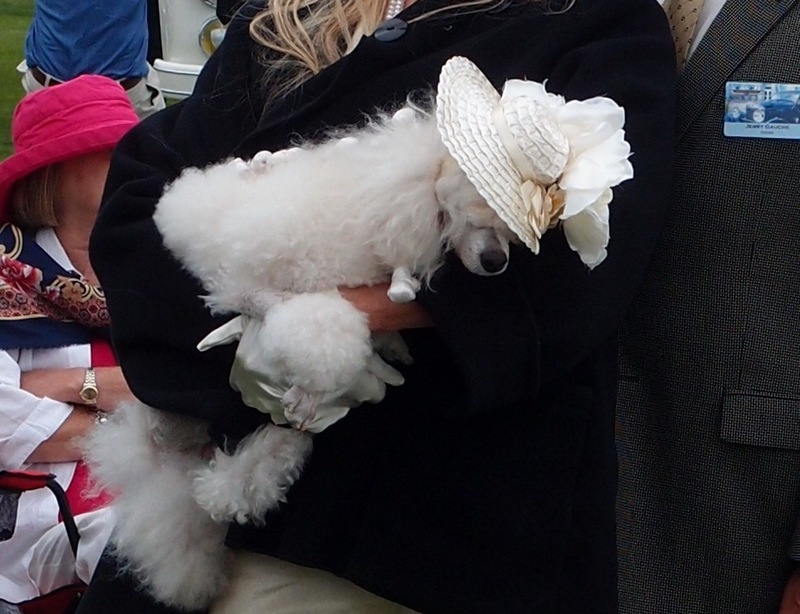 I did see a few hats, but the best thing was a poodle with a hat on. Yup. Anyway. My new site is not nearly as posh as the Concours, but it is more laid back. Hope you'll hang out...I leave again Monday, but I'm sure Roz will hold court, as usual. Sorry. My old blogs crack me up. I'm outa here. Off to discover how the rich and richer do it, here. Get to drive a bunch of Porsches. I think it will be quite lovely. I'm running around last minute, as usual, trying to cram 6 days worth of why-bother-I'll-never-fit-in into a carry-on, inexplicably ironing things and then scrunching them into the case. You think I'd be better at this by now. You'd think. I finally gave up on the list, and handed Christer and Pammy my card and said "you guys go do a top up shopping". I also reminded them to check with Ari because he too, will be eating, and might like a say. I hand them cash as well (carefully separated), but sometimes, if I time it right, I can actually get them to cook a few nights while I'm gone. The ATM spat out 2 50s and 5 20s. I gave Ari the 20s, because if I give him the 50s, apparently, every time a bill or a pizza comes, he says "I don't want to break the 50" and Christer ends up using his money to pay. I love that. 'His' money. 'Their' money. Heh. Sigh. The kids just got back with groceries. Ari hauled it in, peeking in the bags. I asked what they got. "Acne juice," he tells me, pulling out a thing of Coke. I told Christopher I wasn't going to bother putting a texting plan on my phone. Nobody ever answers me, and I end up sending 4 texts (one to each kid that says 'I love youuuuuuu', then a follow up telling them they're evil little non-responding bastards), then just daily to Pammy who promptly answers me, usually with a picture of Maggie sitting at my computer missing me. Pammy is gold. But that means 40 texts go unused. It seems wasteful. It seems silly. It seems I do it every.time.I.go. And it never changes. So, I just put a plan on, because the one time I don't...For a change, I'll be heading back to the U.S. to Anchorage before the month is up - they usually expire. The texts. Not the kids. Maggie is eyeballing my open suitcase. She is not pleased. Last time I was away, she racked up 500 bucks in vet bills. The kids now refer to this as the time Maggie faked her own death to get even at me for leaving her. It's almost worth 500 bucks to have somebody miss me. Though I think JoJo does it for free. *Edit: I just asked JoJo if she was going to miss her Mommy. She said "Mommy who?. And Ari is upstairs eating the junk food Christer bought. He laughed on his way up the stairs and said "you're not even gone yet!" Busy day today...from the NHL coming (maybe?) lockout, to the rights of a sperm donor, to sexsexsex. Must be Friday. Join us for what will no doubt be a spirited talk, in so many ways. Soooo....do we get to know the medical condition of our politicians? Once they're in office? Before they get there? Where's the line? We'll also take a look - and a very big jab - at the guy who wrote his son off - literally - for being gay. Nice good bye letter from your Dad. And they always blame Mom for everything. I'll be co-hosting today. Join us at 5:30 on Square Off, CHCH channel 11. Co-hosting today...what's up with the Mars Rover? What's up with organized crime in the U.S.? And, what's up with taxing our Olympic athletes if they win a medal? Yup. That incentive for a shiny disk has to go through the taxman first. Just like lottery wins. Just like Governor General Awards. Oh wait. Scratch those last two. Just the medals. Join us on CHCH Square Off at 5:30. Ever watched a hummingbird? They never settle on anything, and it exhausts me just watching them. The last one I saw was when I was on the deck at the cottage a couple of weeks back. I heard the unmistakable thrumming - well, I guess that's a lie; I often mistake that noise for a distant airplane at first - but looked up to see the bird. The problem with hummingbirds is that if you glance quickly, you first think it might be a large bug, which makes you jump because it's such a damned ugly bug. Then you realize it is instead a tiny bird, and somehow that makes it far cuter. Perspective is everything, it would seem. It bugs me however, that they don't sit down. Real birds take a load off, at least once in awhile. I drove past a highwire yesterday, just as a whole pack/flock/group of birds were swooping in to do their big sit. A whole string of them queued up on the wire, one after another. There was some jostling going on, and it reminded me of when we used to have to go to pep rallies in the school gym and my friends and I would all try to sit on the same bleacher, and eventually have to scooch over to make room. The birds were scooching, though I'm sure they weren't there to clap for a losing football team and roll their eyes at the cheerleaders who thought they were better than us, even though only one of them could sort of do the splits. I have mourning doves in my backyard, and the things are so lazy they walk everywhere. Seriously. They forage around in the weeds (there is no grass) just like the squirrels and bunnies I have. I will see something moving, get ready to make that stupid noise I make when I see a bunny (the boys now roll their eyes, and no, I can't do the splits) and then realize it is a bird. A bird with wings, too lazy to use them. I put out stale bread and old popcorn and stuff for this zoo I keep in my backyard. Ari was eating corn on the cob on the deck last night, and a wee bunny was eyeing it. I considered tossing down a cob, but then all I could picture was a raccoon in the middle of the night eating corn on the cob, and I didn't. I tossed out some stale taco shells the other day, and only the squirrels would go near them. Expect for one, who gives me the side eye and reminds me he's gluten free. I'm typing this around JoJo's Rubenesque form lying on my lap. She's been cacking up too many hairballs, so I found her brush and now I brush her. She actually likes it, unless I touch *that* spot by mistake and then she turns into something from the Exorcist and draws blood. Ten minutes later I've barely staunched the blood, and she's back on my lap deciding we can try again. It's dark and raining here, and I'm supposed to be doing touch up painting in My Nearly Done Bathroom. Instead I'm doing laundry, paying bills and staring at a hallway clogged with garbage bags full of clothes to drop off somewhere. I decided to do my spring cleaning. I have a closet that has the normal row of hangers in front, then another behind it. Way behind it. If I go back there, we tie a rope around my ankle to pull me out. I tossed things that have been back there for a decade. The good thing about cleaning my bedroom? The things I find: the party pack of 9Vs to change the smoke detectors, the fitted sheet for that set of sheets I haven't been able to use, two pairs of black sandals I forgot I bought, a Shopper's bag with shampoo and stuff in it, a red sweater I lost and love, another red sweater I lost and hate, three chargers to things I no longer own, a stack of Vanity Fairs for Roz, 9 scrunchies the cats had chased under the dresser, and a rechargeable phone I've been accusing the boys of losing. I was dumping my purse upside down yesterday to pay for a coffee at the bookstore. I knew I had a crapload of change, and there was no lineup. As the guy patiently waited, I stared what had fallen into my hand: a video card, a silver hoop earring, a boarding pass, a safety pin, a nail file, a mini flashlight, a mini screwdriver and over 22 bucks in change. I used to always have a corkscrew, but I've had too many confiscated at customs. That, and Ari was horrified one day when he was little to discover that I carried a corkscrew with me. "Oh my god, you have a CORKSCREW IN YOUR PURSE?". I can still hear him. I'm still missing a white leather jacket (do not worry: I bought another one), and we're still down a phone. Ask Roz about her earrings some time. I dream of a day where everything is in its place and I don't lose things. Dream big or go home.